Your task is to plan out a procedure for carrying out each investigation, communicate the procedure with Mrs. Cule, carry out the investigation, then report on your findings in two reports (one for temperature vs. reaction rate and one for particle size vs. reaction rate). 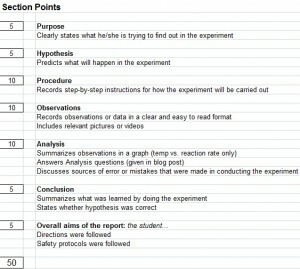 Below is the rubric that I will be using to mark your reports. For Temperature Lab: Use what you’ve learned in this lab to explain why we put leftover food in the fridge instead of leaving them on the counter. For Temperature Lab: Use what you’ve learned in this lab to explain why it is harder to keep a bonfire going on a cold day than a warm one. For Particle Size Lab: Use what you’ve learned in this lab to explain why baking a dozen cupcakes requires less time than the equivalent amount of batter in a cake pan. 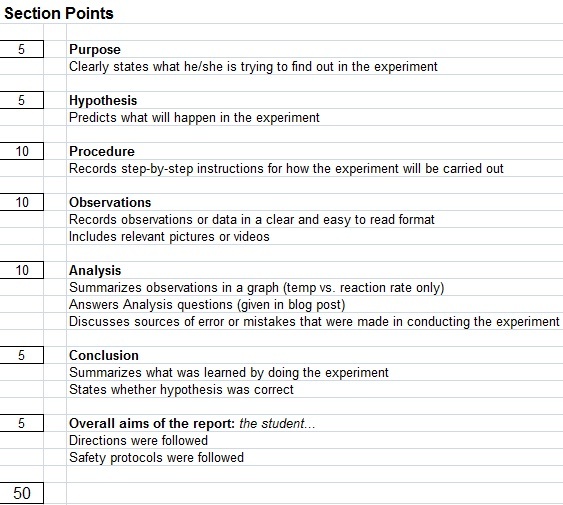 For Particle Size Lab: Use what you’ve learned in this lab to explain why we use kindling to start a fire.